June 5 (Friday) was probably the most gruelling day of my life in recent times. I bought two home pregnancy tests (HPTs) at Mercury Drug on my way home from my night job. When hubby left for work, I used one and voila - the second line appeared! This can't be - I thought to myself. I was diagnosed with polycystic ovaries in 2013, same month. The problem lies with my follicles/eggs not "popping" out. I seemed to be going through what I read as "false ovulation" - all this time. My husband and I knew we won't be having an easy time conceiving. We once got help from the ob-gyn to help stimulate my hormones and induce "popping" the follicles. That didn't work. Since we didn't have enough time for all the lengthy procedures, we changed our plans - and just waited. A month at my new work, I noticed my period was delayed for 5 days already. I kind of expected it. The change in people's daily routine can certainly alter the way our bodies function. One more week passed. I felt strange feeling the usual pre-menstrual symptoms, and yet nothing was coming. Then came June 5. It was gruelling because I felt a mix of emotions - so anxious and paranoid and afraid, yet anticipating and secretly giddy. I couldn't sleep nor wait for the next day, when I planned to secretly see an ob-gyn again and confirm what I discovered. The next day June 6, the doctor had me took another HPT at her clinic. I was assured that the best hopes one can have for conceiving is a regular monthly period - so I should no longer be wondering. What I planned as a surprise for hubby's birthday on the 19th came early that day when I asked him to go with me to the laboratory. And he was quite excited he can't not announce it in Facebook. 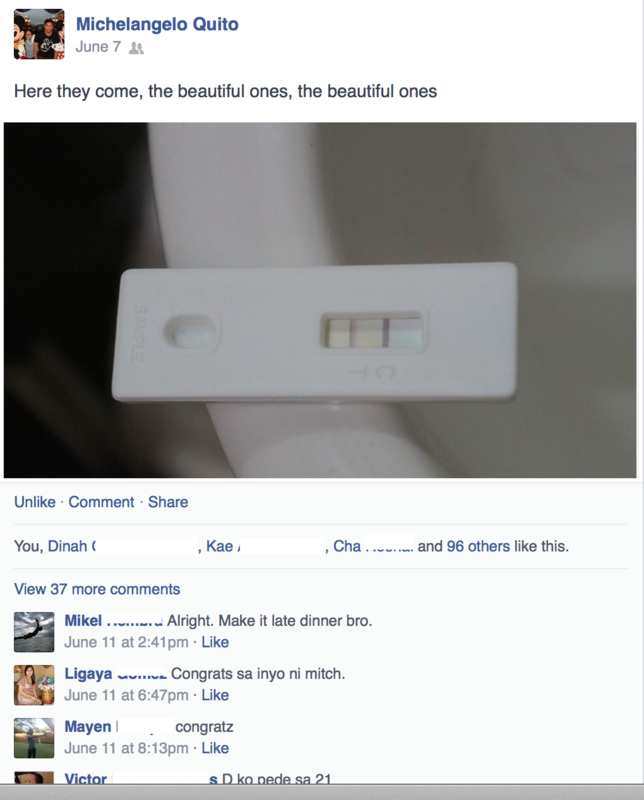 I could tell he wasn't an excited expectant father. ;) Hope we could channel all those likes into some health-giving energy for me and our little "sesame seed". Right now, I'm at 6 weeks - feeling lethargic and nauseous most of the time. My tastebuds are fickle and my eating habits have gone haywire. My all-time-favorite pepperoni pizza doesn't appeal to me anymore. I don't crave for green mango with bagoong (shrimp paste). I just want food with simple flavors - milk and bread, and eggs and fruits. Yes, I'm glad I don't dislike fruits. P.S. My attempt to write a longer than usual post. Hope to write more frequently about my journey to mommy-hood *fingers crossed*. Hiring musicians for our wedding was last among our priorities. When Mike shared his thoughts that he would want to hear violin playing while we're having our first dance, we decided to go for it. 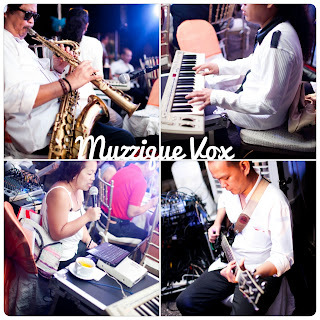 A few weeks before our wedding, when Al Espina of Juan Carlo suggested Muzziqe Vox who often plays at Fernbrook Garden weddings, we got in touch with Iggy Rey, the band's manager. There isn't a lot of feedback about the band over the Internet or at Weddings at Work (W@W), but we booked them, without looking for at other options. It was a good thing that they waived their out-of-town fee given that our wedding is in Talisay, Batangas. Aljoe Mix is Juan Carlo's partner in providing basic light and sounds system. We did not transact with them personally. It was Al from JC who did all the coordination with Aljoe Mix. We had our ceremony outdoor so I was worried that the basic sound system may not be enough to cover our venue. 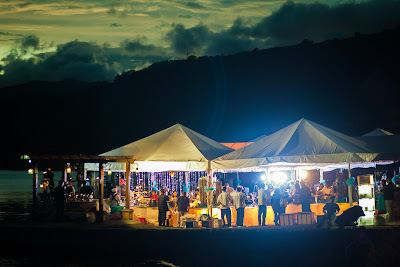 Al assured me that Aljoe Mix is a frequent supplier in Club Balai Isabel and so that shouldn't be a concern. The amplification the sound system did to our hired musicians (Muzzique Vox) was excellent. During the ceremony proper, however, there were glitches in the sound coming from the microphone. I noticed that while our officiant and our parents were giving their speeches. I'm not sure what happened or what caused it. It was quite windy during that time. We were running out of time when Mike & I decided to get Wink as our wedding invites suppliers. Their location is very convenient for us (within our neighborhood). We wanted a unique invitation, Mike was so particular with this. It should be something that showcases our personality and common interests (much like the wedding cake!) That's why we also got Wink to create a custom design for us. Stefanie Mercado handled our account and gave us the initial layouts. Once we approve them, the invitations will be printed after 10 working days. But the first layout didn't sit well with us. So, Stef sent another proof (sorry can't find the files! 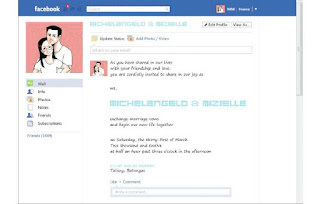 ), and that time we had two different layouts again. Still, I wasn't happy with them.